We all know that Kodi’s developers are hard at work when it comes to supporting numerous platforms. And as you already know, you can install Kodi on your Mac as a native application, taking full advantage of advanced MacOS’ gestures and controls. And we’re here to teach you how to get started with this home theater software. Please note that we’ll be talking about installing the latest available Kodi 18.0 version, which requires you to run OS X 10.9 or better. Other than that, you should be good to go. Warning: Why you must NOT USE Kodi without VPN? Using ILLEGAL Kodi Addons are Dangerous without a VPN: Most of the Kodi users are installing the ILLEGAL Kodi addons on their system to access all the latest movies, TV shows, sports, music, and much more for FREE, than a legal Kodi addon where it has the least content in it. But do you know what? The video content on illegal addons is a scraped and copyrighted material. If you are accessing them on Kodi, then your activities will be monitored by your ISP by tracking your IP and gives all the information to the government or companies if they request for it. This will land you in trouble. To stay away from this, you will have to connect to a VPN where it hides your identity by rotating your IP address while streaming Kodi content. This is how you will be safe from the prying eyes. The above are the 2 reasons that forcing us to recommend a VPN to the Kodi users for safer streaming. In fact, after testing several VPNs for Kodi, we finally came up with a one non-stop solution and that is ExpressVPN, the top rated Kodi VPN so far. Before we continue, let’s quickly go over the official requirements, to make sure you can run Kodi up to its full extent. CPU: Kodi runs on both x86 and x64 processors. Since Macs are powered by 64bit processors, even a couple-of-years-old Mac will run Kodi just fine. GPU: This application requires a GPU (video card) that supports hardware video decoding and OpenGL 2.0. Even a very old GPUs support this feature. 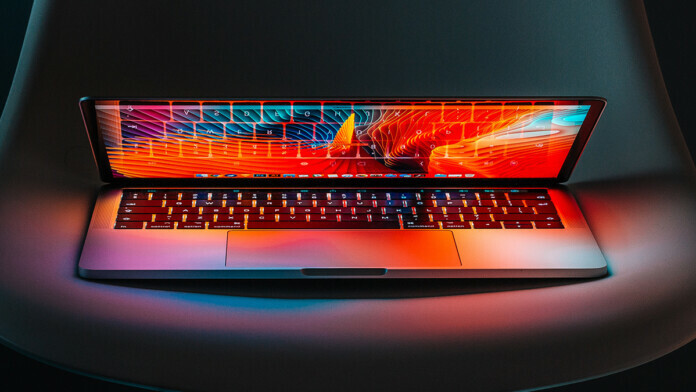 Macs are powered by the latest generation of integrated and dedicated GPU units that have a lot of power. Running Kodi isn’t an issue for them. RAM: Your Mac needs to have at least 2GB of RAM. However, it’s recommended to have 4GB of RAM for the overall stability of your operating system. Available Space: Kodi is a lightweight app when it comes to its size. It will take around 150MB of free space, which isn’t much. However, you need to have a lot of space if you planning on importing locally stored movies and files. If you already have that library on your computer, Kodi will simply use those files, without copying them. Operating System: As said before, you need to be running OS X 10.9 or higher. As said earlier, there’s only one way to install Kodi 18 on Mac in 2019, and that is by downloading its DMG file (from the official website). The first step includes downloading Kodi’s DMG file. Go to the official Kodi website. In the top-right corner, click on the blue ‘Download’ button. This will take you to a page which serves as an overview of available versions for Kodi. Scroll down until you see a section called ‘Choose Your Weapon’. As you’ll see, Kodi brings incredibly wide compatibility with different platforms. You can install Kodi on Windows, Android, MacOS, Linux, Raspberry Pi, iOS, Firestick, Roku, Xbox, and other. 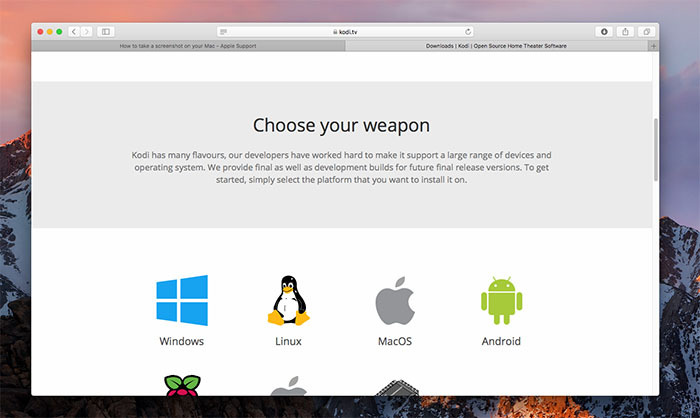 However, you need to click on the Apple logo to access the macOS version of Kodi. A new pop-up window will appear. Feel free to click on the button that says ‘Installer (64bit)’ next to ‘Release’. This is the latest official version of Kodi. Your Web browser will now download the file that is around 64MB in size. Once this process is completed, you’ll find the file in your Downloads folder. Locate this folder in the bottom-positioned Dock and open it. What you should see now is a blue-colored window that says ‘Kodi’. Simply drag-and-drop Kodi’s icon onto the Applications folder – both of which can be found here. 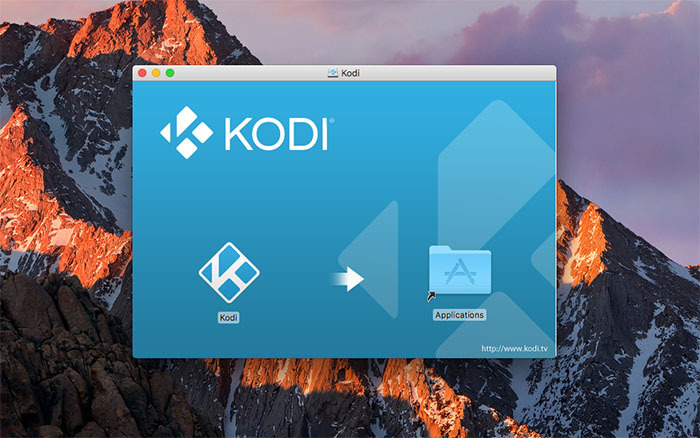 After a couple of seconds, you’ll successfully install Kodi for Mac. Kodi can be found in the Applications folder. 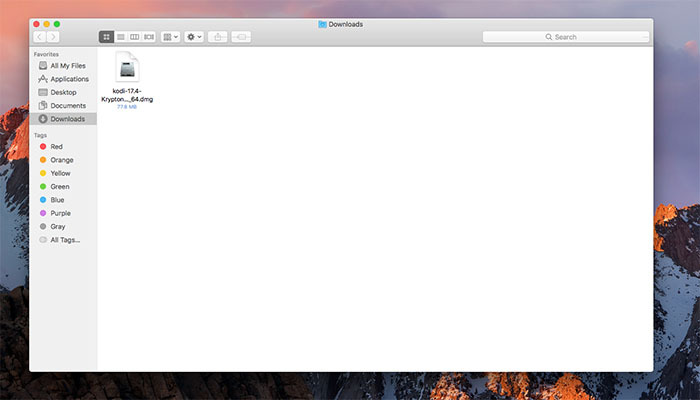 You can navigate to this folder by opening Finder and picking ‘Applications’ from the left-positioned sidebar. This is where Kodi awaits. To open Kodi, double-click on it. However, your system might prevent it from opening since it doesn’t trust third-party applications. Here’s how to solve this issue. Use the CMD key and right-click the Kodi application, and click Open. If this doesn’t work, got to System Preferences. This option is found by clicking on the top-left positioned Apple logo. Go to Security & Privacy, and pick ‘Anywhere’ next to ‘Allow applications downloaded from:’. Aside from teaching you how to install Kodi 18 on Mac, we also want to give you a few pointers on how to use it. With this said, we think you’ll find the following resources to be helpful, so check them out. As you’ll soon see, Kodi is a very simple app in its core but also a highly capable one. It will take some time until you explore all of its features and learn how to get the most out of it. In case of any issues, don’t hesitate to post a comment below. Also, we’d appreciate if you could share this article online. To stay on top of the latest information, follow TechNadu on Twitter and Facebook. Thank you!